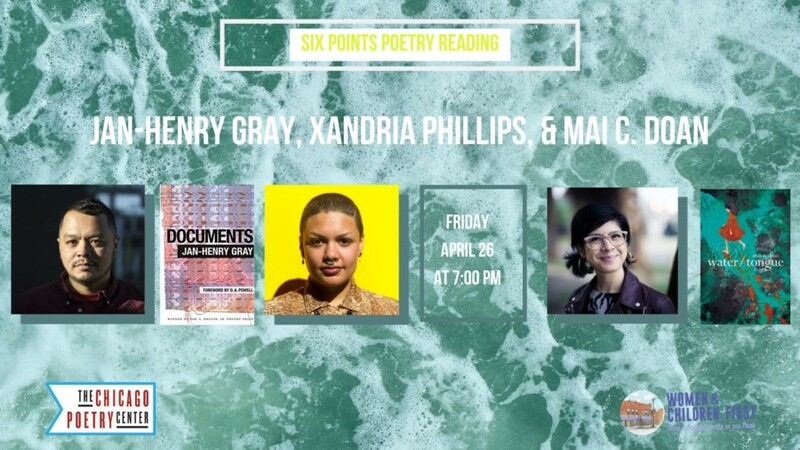 The Chicago Poetry Center will host a reading at Women & Children First bookstore featuring Jan-Henry Gray, Xandria Phillips, and mai c. doan from 7-8:30pm. This is a joint book release event for Documents by Jan-Henry Gray and water/tongue by mai c. doan. A conversation with all three readers on first books will follow the reading. As always, our readings are free and open to the public. Curated and hosted by Doe Parker. Books will be available for purchase. Jan-Henry Gray was born in the Philippines, grew up in California, and worked as a chef in San Francisco for more than 12 years. He has lived undocumented in the US for more than 32 years. A graduate of San Francisco State University and Columbia College Chicago’s MFA program, he is the recipient of awards from the Jack Kent Cooke Foundation, the Academy of American Poets, and the Undocupoets Fellowship. Jan lives in Chicago, where he co-hosts Meanwhile, a zine-making storytelling show. Jan’s writing can be found in Nepantla: An Anthology for Queer Poets of Color, The Rumpus, Tupelo Quarterly, Colorado Review, DIAGRAM, Fourteen Hills, The Margins, Puerto del Sol, and other journals. He is the author of the chapbook Selected Emails. His first book, Documents, was chosen by D.A. Powell as the winner of BOA Editions’ 2018 Poulin Poetry Prize. Xandria Phillips is a poet, educator, visual artist, and the author of HULL (Nightboat Books 2019) and Reasons For Smoking, which won the 2016 Seattle Review chapbook contest judged by Claudia Rankine. They are the poetry editor at Honeysuckle Press and the curator of Love Letters to Spooks, a literary space for Black people. Xandria is the former Associate Poetry Editor of Winter Tangerine, and frequently advises for their live NYC workshops hosted by Poets House. Xandria’s work has been featured in The American Poetry Review, Beloit Poetry Journal, Black Warrior Review, Crazyhorse, and elsewhere. They currently live and breathe in Chicago, Illinois. mai c. doan is a writer from Los Angeles, CA. She has published and performed her work though the National Queer Arts Festival, RADAR Productions, HOLD: a journal, Entropy Magazine, Mixed Up! : A Zine about Mixed Race Queer and Feminist Experience, and more. She is a 2016 recipient of the James D. Phelan Literary Award and holds an MFA from Mills College, where she attended as a Community Engagement Fellow. She lives in Chicago, IL. Her first full-length poetry collection, water/tongue, is forthcoming from Omnidawn Publishing in Spring 2019. Women & Children First is wheelchair accessible, however our bathrooms are not–there is a narrow hallway and sharp 90-degree turn on the way to our bathrooms. Seating is first-come, first-served, but we are happy to reserve seats for people with disabilities. Please call the store at 773-769-9299 the day of the event if you need a reserved seat or have additional questions.